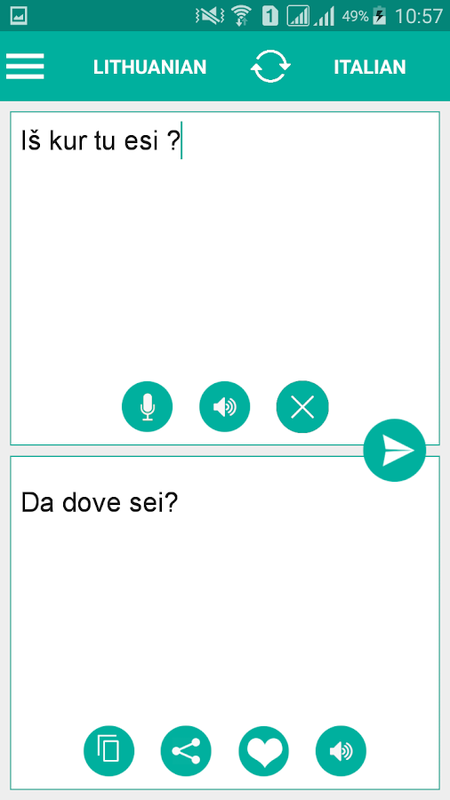 This free application is able to translate words and textfromLithuanian to Italian, and from Italian to Lithuanian.Bestapplication for easy and fast translation, which can be usedlike adictionary. If you are a student, tourist or traveler, itwillhelps you to learn the Lithuanian or Italian language!LithuanianItalian Translator has these features: ☆ Hear translatedtext inLithuanian or Italian ☆ Social Media - Share your translatedtextdirectly with friends through Instagram, Facebook,Twitter,Google+, SMS, Email, Messenger.... ☆ Lithuanian ItalianTranslator☆ Italian Lithuanian Translator ☆ Clipboard translate -copy textfrom other app to clipboard and paste into our app. Itwilltranslate that text to your selected language ☆ Simpleanduser-friendly interface ☆ Voice input - input text byrecordingyour voice, quick and easy recognize to translate toLithuanian orItalian ☆ Camera translation - select region of textfrom imagecaptured by camera or region of text from gallery imageand our appwill translate it for you ☆ History - remember all yourprevioustranslations for you. You can select words or sentencesyou'vealready translated in the past and see it result. Offlineaccessfor translated words, text and sentences. ☆ Favoritetranslation -list all your favorite words or sentences when youclick ourfavorite button. Free translator from Lithuanian toItalian, andfrom Italian to Lithuanian. Bonus Feature – Learn andMaster thepronunciation as Lithuanian Italian Translator has inbuilt audiofeature. Hear the translated text and convenientlycommunicate withyour friends, girlfriends, boyfriends, familymembers or tourists.We have Italian translator for other languagestoo, for e.g.English, Arabic, German, and many more. Drop us anemail if you areinterested. We would love to hear your suggestions& feedbackfor Lithuanian Italian Translator! Please continue tosendquestions, suggestions and ideas to [email protected] like our application please rate 5 start for us Thank foryoursupport! Playful English learning for 2-6 year old kids, with guaranteedresults. Join the pre-school English learning family now! 👍 Foundedby English teacher and Oxford University languages graduate TobyMather, Lingumi is the most fun, effective, and affordable way foryour child to learn to speak and understand English at home.Teaching English to kids around the world in classrooms, Tobybecame frustrated that there was no easy and effective way forchildren to begin English before they reached primary school. Now,our award-winning team of designers, programmers, and linguists ismaking that possible for you and your child. Our mission at Lingumiis to make English learning fun, affordable and effective for thenext 500 million young learners. And we even guarantee progress:within 3 months, your child will have learned more than 120 words,understand questions, be able to speak short sentences in English.- Try it free: Play 5 free lessons with your child and become partof our global learning family - Playful: Hundreds of playfulEnglish learning games for kids - Scientific: Curriculum developedby our head of Curriculum, Dr Dara Jokilehto, PhD (Linguistics) -Guaranteed learning success: we’ll explain what your child willlearn, and approximately how long it will take - Screen-time cap:We only open one new 10-minute English lesson per day so that yourchild does not spend too much time in front of a screen Why shouldmy child learn English before 6 years old? 2 - 6 years is the bestage for children to learn a new language. We call it the ""magicwindow"", and academics call it the ‘critical period’. It’s a timewhen children can naturally absorb their mother tongue, as well asa second language, naturally. As we grow older, learning languagesgets harder and harder. Our Curriculum is designed to follow theway children naturally learn their mother tongue, teaching Englishvisually and playfully. We offer a free trial, so you can testLingumi to see if it’s right for you and your child. After the freetrial, we offer a subscription: it’s 90% cheaper than languageclasses with a teacher, and helps us to continue our research anddevelopment, and keep improving Lingumi for you.. We try to keepthe price as low as possible because we think English learningshould be accessible to everyone, not just the rich. Most of all,we care about playful, successful learning. If you and your childdon’t see any learning results within 30 lessons, we’ll refund you! Features • More than 1400 common and essential words to learn •Learn words with perfect pronunciation • Visual cue images / photos• Simple and easy to memorize definitions • Plenty of examplesentences • Easily learn English vocabulary words with flashcardgame backed by science • Separate tabs to practice your learned,favorite and all words • Helpful for anybody preparing for IELTS,TOEFL, GRE, and SAT exam Have you ever felt like there is a thoughtin your mind that you can’t express in English? While listening toEnglish music or watching English movies, TV series or news nomatter how hard you try you don’t understand what they are saying?Well, that’s because you are not familiar with the Englishvocabulary words they are using. To communicate effectively inEnglish, it is extremely necessary to have a good understanding andimprove your English vocabulary. Learning English vocabulary won’tjust make it easier to communicate, watching TV programs andlistening to music but it will also help you to learn anything inthe world you want to learn. As learning and improving your Englishvocabulary can bring you so many benefits but it isn’t always easyto learn English vocabulary. While other vocabulary builder appsare providing you with complicated meaning that leaves you confusedand bomber you with annoying pop-up ads, we focus on providing thepremium quality user experience for free. There are hundreds ofthousand English vocabulary words you can learn, but not all thevocabulary words are useful. To save you time from learningunnecessary English vocabulary words, we hired expert teachers tocollect a collection of important words for you. We exactly knowwhat kind of problems people face while learning Englishvocabulary. Don’t you think sometimes vocabulary builder apps useunnecessarily complicated definition to define a simple word?That’s why we provide each word with a simple meaning and to makeit even easier to understand, we provide many synonyms. All Englishlearners have had that embarrassing moment when you learn a wordand somebody tells you that you are pronouncing the wordincorrectly. To prevent you from having that kind of shame andembarrassment in front of people, in our English vocabulary builderapp we have English word pronunciation with audio. So now you canlisten and learn perfect English pronunciation. The most importantthing you have to remember while learning English vocabulary is, itis easy to memorize words but it’s waste of time if you can’t usethe words in sentences. That’s why we provide plenty of examplesentences which will surely give the idea of how to use the wordsin sentences in real life conversations. In almost all vocabularybuilder apps, you will find that there is a mechanism to learnwords but there is no way to review words that you have learned. Weknow It is very important to revisit words after you have learnedthem. That’s why our vocabulary builder app has a separate sectionfor your learned words. There are also separate sections for yourfavorite words and all the words in the app. Spaced repetitionflashcards A learning technique that incorporates increasingintervals of time between subsequent review and testing ofpreviously learned material in order to exploit the psychologicalspacing effect. The notion that spaced repetition could be used forimproving learning was first proposed in the book Psychology ofStudy by Professor C. A. Mace in 1932. Spaced repetition wasoriginally implemented through the use of flashcard systems.Luckily for you, we have spaced repetition flashcards game in ourvocabulary builder app which is similar to English word quiz andhelps you easily memorize the English vocabulary words in yourlong-term memory. English Story with audios is a free application, this app provideyou many stories with transcription and audio. English Story withAudios will help you relax after a work hard day. You can let yourchild listen to this app with many fairy tail story. If you are aEnglish learner, you can use this app to learn. We providetranscript to help you to follow speaker and dictionary function tohelp you to understand which word you do not understand clearly.Hope that you love this app. English Korean Dictionary Easy to use. Offline Dictionary.